Last issue in this book, the future Brootherhood was back. But how? Some of them died in the Battle of the Atom mini event? What's gives brah? Don't worry folks, all questions will be answered, along with new questions raised at the end of this book. Why? Because how else does Bendis keep you coming back for more? Oh Bendis, how I love thee. Back to business! This issue opens up with a future beast who's basically mind raped himself into a fur all of crazy. In a room full of chalkboards, he's figuring names and dates of the past, trying to put everything in place. After all, this is the man who brought the original X-Men back in time and sort of destroyed the time stream by himself. He's approached by Xavier (our Xavier's son) and Raze. (Son of Wolverine and mystique...yo, she really gets around huh?) They've come to recruit Hank for their plan to fix everything in the time stream. But how? Back in our time, X-23, left for dead by Raze finally wakes up after some prolonged healing and immediately starts the hunt back to the school. 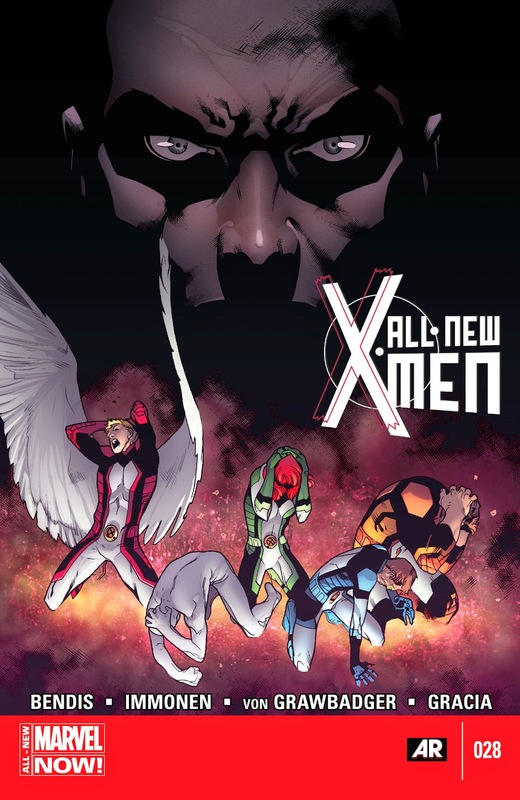 Meanwhile, at the school, Xavier has taken control of Jean and the Stepford cuckoos and is basically squeezing everyone's brain except Scott and Emma. Why, because plot. And Emma's got psychic powers but whatever, plot. He's talking to Jean inside her head and tells her almost his whole plot. He hates the X-Men. He hates what they've become, especially after his fathers death. How they stand for his views, but haven't changed anything. All the fighting and death for absolutely nothing. Another flashback takes us to Madripoor, the place where future Xavier is basing his operations. And a place mutants can't seem to never go to for plot related purposes. Xavier has his plan mapped out, but Beast is the only one with any kind of valid argument. Good thing Xavier is a psychic and he warps everyone in the room to agree to the plans. So are these mutants truly the new Brotherhood or are they just being forced? Back in present day Canada, the new future Brotherhood has caught up to Scott and Xavier almost forces Scott to kill young a Jean Grey. This would cause the Phoenix to be non existent. And if the Phoenix doesn't exist, then AvX can't happen, and Scott doesn't kill Charles. All of this would drastically change the way the future is mapped out. Just as Scott is about to do it, Emma jumps in the way and actually knocks his eye blast into Beast. Maybe he's died again, hehe. Speaking of some of them being dead, a question is raised. How are they back? Beast definitely died. Xorn died. How did they make it back? To find out we must go...Back to the Future! The trick is, they come back in time to a time where younger baby Xavier and Raze are already born. That way if the older selves die, the younger ones can grow up and we do this all over again. Congrats, the secret to beating time travel is killing babies! Just as Raze comes up with the genius plan, he gets a note from himself from the past telling him exactly what happened in Battle of the Atom and how to come back again. Well, ain't that just convenient? The new plan is not to come to the past and destroy the X-Men. It's to come back and kill Jean Grey. The final pages in the book show Jean's usefulness perfectly. She's inside her own head talking to Xavier or rather...distracting him. She says he's not ready for what's about to come. And with Xavier's team knocked down by Scott's eye blast, there's two claws and a pissed off teenager who's coming for his head. This issue was a bang up job by everyone involved. I'm absolutely loving this team up of Bendis/Immonen and it isn't the first time they've teamed up to make magic happen before. This day in comics, it's very rare to see a creative team go more than one or two story arcs together. This is a team I truly enjoy reading though. The skills coming out of both ends compliment each other perfectly. I hope these two stay on this book for a very long time. Until next week readers!